This review first appeared in Turbula in January 2008. Longtime Austin blues scene fixture Toni Price relocated to Oceanside in the fall of '07, shortly after releasing her latest album on the late Cliff Antone's blues label. 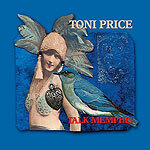 "Talk Memphis" has the same addictive mixture of blues and rock that got her AAA radio airplay with her 1993 debut, "Swim Away." Surrounded by Austin stalwarts George Rains (drums) and Derek O'Brien (guitar), and tackling material from songwriters like Isaac Hayes, Allen Toussaint, Jesse Winchester and longtime collaborator Gwil Owen, the 13 tracks here alternately smolder and sizzle  with Price honing the intensity of her vocals, somehow taking the emotional abandon of Janis Joplin and focusing it to a fine edge. Amazing stuff  here's hoping against hope that she becomes a regular on the San Diego scene.